Retrieving water depth, and correcting for confounding effects of water column on spectral radiances over shallow bottoms has been a much wanted progress since the advent of earth observation from space. Empirical: most require existing field data for operating a very simplified radiative transfer equation (RTE) through band ratios. Field data are used to specify multi-linear regression coefficients in a very simple formula which uses spectral bands to compute depth in meters; this is a way to make an assumption on the bottom substrate spectral properties at null depth. They are used to map either the water depth or depth-invariant water column corrected pair-wise reflectance indexes for the purpose of shallow bottom typing. They all assume homogeneous atmosphere and water body, and clear waters. They are used for various purposes by a great number of practioners, most of them isolated, and even by NOAA, IHO-IOC GEBCO Cook Book, and US Naval Postgraduate School. It is quite clear though that most users will want to retain control on the process, subject to their specific needs, and time/cost contraints. 4SM alleviates some of the limitations of the band ratio approaches, so that a lay practioner can process his/her multi/hyper-spectral air/space-borne imagery in record time at low cost, without the need for any field data. Digital numbers: 4SM reads the raw radiances of the original data in units of DNs: in a ratio method, radiances do not need to be calibrated in physical units. Deep water radiance: 4SM uses a deep water area of the image to estimate the spectral TOA deep water radiance Lsw. Glint: 4SM uses a deep water area to estimate glint regressions. Deglinting uses a NIR or SWIR band to estimate and remove the glint component of the raw TOA radiance in all bands. Whatever remaining amount of glint shall be incorporated in the atmospheric path radiance La. Brightest Pixels Line: 4SM extracts the brightest shallow pixels in band i for the whole range of radiances in band j, for all pairs of bands i and j. After linearization, these pixels plot in an approximately straight line in a bi-dimensional plot (a variant of Lyzenga's proposition). The slope of this straight line measures the ratio Kdi/Kdj of operational diffuse attenuations coefficients Kdi and Kdj. Water type: as pointed out by Jerlov, and then Kirk, the ratio Ki/Kj for one pair of bands, at wavelengths WLi and WLj, may be used to interpolate the diffuse attenuation coefficient Kd in m-1 for all visible bands. Therefore, depths retrieved by 4SM shall only need to be multiplied by a (often negligeable) depth correcting factor to be derived at first opportunity from existing field data. Soil Line: 4SM uses some bare land in the image to specify the spectral Soil Line for all pairs of bands: this is an extension of the way NDVI is measured. The Soil Line represents a model of the spectral signature of non-contrasted substrates at null depth, from bright to dark. After a few days/hours of work, the working database is prepared, and the 4SM command line script specifies all parameters that are necessary to operate the inverse simplified RTE : LB=Lw+(Ls-Lw)*exp(2K*Z). for each shallow pixel: Z is increased until the water column corrected bottom substrate signature LB reaches an acceptable fit with the Soil Line (a form of optimization). this yields both the estimated depth of the shallow bottom, and its BOA water column corrected signature LB in units of DNs. this is done through the deglinting process, and also through an edge-preserving smoothing scheme. processing the whole 17 bands CASI dataset of Heron Island only takes 110 minutes on a X86 laptop running Linux. The water column corrected image is now suitable for bottom type classification. Together with the bathymetric map, these results shall be quite usefull for planning field work. 4SM now routinely adds the Panchromatic band to the standard multispectral bands of Landsat 8 and WorldView 2 images. Therefore, four bands are available instead of three to compute a four bands water column corrected bottom signature in the ~8-20 m depth range. 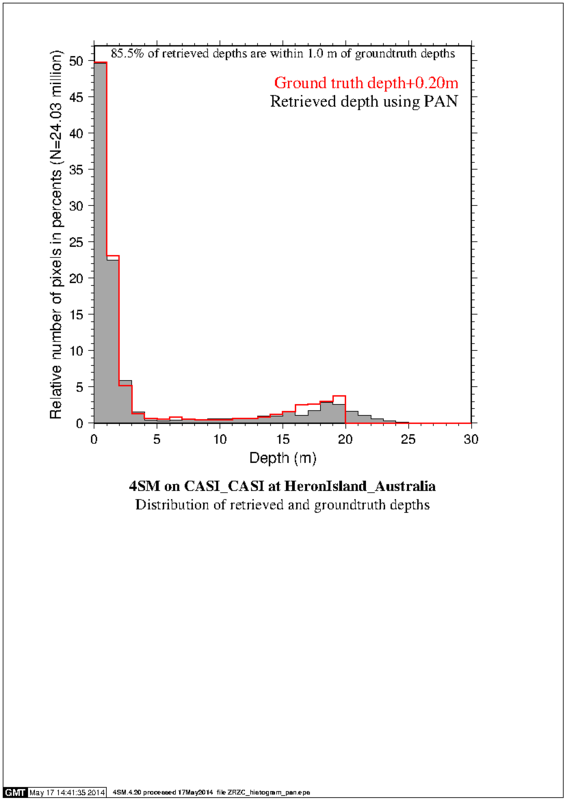 This means that bottom typing now can be achieved in a homogeneous way for the whole 0-20 m depth range in clear waters: see an example at http://www.watercolumncorrection.com/web-sharkbay-olip.php. 4SM now uses Landsat 8 metadata to convert TOA radiances into BOA calibrated reflectances in the range of 0-1. This shall become handy for time series monitoring of bottom substrates. 4SM tutorials use small image subsets to take you up the learning curve, step by step, on your own Linux box, for free. More tutorials should be developped. 4SM should now be ported as a new tool under ENVI. 4SM relies on GMT from University of Hawaii for preparing PostScript displays , and on OpenEV for image display and manipulation, on a 32 bits X86 machine or a 64 bits AMD64 machine running Ubuntu Linux. It is compiled by gcc, and controlled through a bash formated command line. Here is a detailed flowchart of the operational process. * which areas of this image are worthy of shallow water work? uploading of the result zifiles, and reporting in this website. by the Biophysical Remote Sensing Group at the University of Queensland. This is presented at http://www.watercolumncorrection.com/heron-casi.php.